Brand new 2019 Lagoon 40, 3 cabin version, owners layout and upgraded 45hp Yanmar engines. She is ready to be sailed away to her new owner. Her inventory is complete with Asia cruising in mind and includes generator, air-con, B&G navigation instruments and AIS, electric toilets and plenty of refrigeration to name a few. This is a great opportunity to avoid the lead time of a new order and be on the water cruising this Spring time. For more information contact us today, finance avaialble and part exchange may be considered. 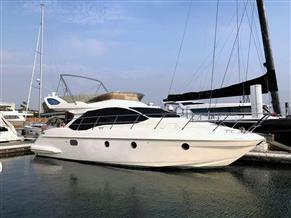 Viewing a yacht in Singapore is easy with our experienced team of Brokers. We can collect you from the airport, your hotel or any other location and take you to see yachts at one of the many picturesque marine locations around the territories making life simple and stress free for you. We can help arrange finance, moorings, management and provide many other services to make yacht purchase and ownership seamless.